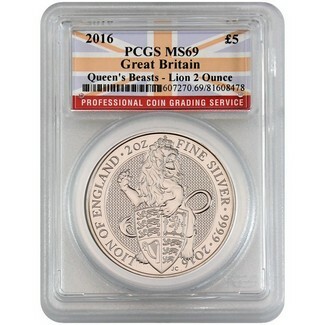 This is the first official UK 2oz silver bullion coin from The Royal Mint, certified in MS69 condition by PCGS. The obverse features the image of Queen Elizabeth II by Royal Mint Coin Designer Jody Clark. The reverse features the rampant lion fiercely guarding the heraldic shield that is so integral to the British monarchy’s story.